, corresponding to N terminal amino acids 2-13 of Human RNF34. Principal Names – RNF34; RFI; RIFF; FLJ21786; ring finger protein 34; RING finger protein RIFF. Official Gene Symbol - RNF34. GenBank Accession Number – NP_079402. LocusLink ID - 80196 (human); 80751 (mouse); 282845 (rat). Gene Ontology terms - electron transporter activity; electron transport. Our Abpromise guarantee covers the use of ab4363 in the following tested applications. WB Use a concentration of 1 µg/ml. No signal obtained yet but low background observed in Human Testis lysate. E3 ubiquitin-protein ligase that regulates several biological processes through the ubiquitin-mediated proteasomal degradation of various target proteins. Ubiquitinates the caspases CASP8 and CASP10, promoting their proteasomal degradation, to negatively regulate cell death downstream of death domain receptors in the extrinsic pathway of apoptosis (PubMed:15069192). May mediate 'Lys-48'-linked polyubiquitination of RIPK1 and its subsequent proteasomal degradation thereby indirectly regulating the tumor necrosis factor-mediated signaling pathway (Ref.13). Negatively regulates p53/TP53 through its direct ubiquitination and targeting to proteasomal degradation (PubMed:17121812). Indirectly, may also negatively regulate p53/TP53 through ubiquitination and degradation of SFN (PubMed:18382127). Mediates PPARGC1A proteasomal degradation probably through ubiquitination thereby indirectly regulating the metabolism of brown fat cells (PubMed:22064484). Possibly involved in innate immunity, through 'Lys-48'-linked polyubiquitination of NOD1 and its subsequent proteasomal degradation (PubMed:25012219). Ubiquitous. Detected in heart, brain, liver, skeletal muscle, kidney, pancreas, spleen, thymus, prostate, testis, ovary, colon and leukocytes. The RING-type zinc finger is required for the ubiquitination of target proteins. The FYVE-type zinc finger domain is required for localization and may confer affinity for cellular compartments enriched in phosphatidylinositol 5-phosphate and phosphatidylinositol 3-phosphate phospholipids. Proteolytically cleaved by caspases upon induction of apoptosis by TNF. Cell membrane. Endomembrane system. Nucleus. Nucleus speckle. Cytoplasm, cytosol. 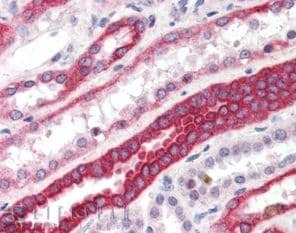 ab4363 at 3.8µg/ml staining human kidney tissue sections by Immunohistochemistry (Formalin fixed paraffin-embedded tissue sections). Tissue underwent steam antigen retrieval in citrate buffer at pH 6.0. AP staining procedure was used for staining. ab4363 has not yet been referenced specifically in any publications. Publishing research using ab4363? Please let us know so that we can cite the reference in this datasheet. There are currently no Customer reviews or Questions for ab4363.